Child custody orders exist in California to provide a legal standard regarding a child’s care and wellbeing. A custody order is always created based on what is best for the child, or a legal standard called ‘the child’s best interest’. However, as a child grows, his or her family changes, the lives of his or her parents change, and the child’s best interest changes, a child custody order may need to be modified in order to keep up with the child’s best interests. In California, it is not uncommon to renegotiate the terms of a child custody order every two and a half to three years as a child grows up. The process of modifying a child custody order can be complex, especially if the parents are not on the same page. Regardless, it is always a good idea to work with a legal professional before signing any legally binding documents, especially when the lives of your children will be affected. This is a basic overview of modifying child custody in California, but does not constitute legal advice. What is Included in a Child Custody Order? What will my Child Custody Order in Irvine, California contain? In California, a child custody order contains terms that state how the custody of a child will be divided between his or her two parents in two ways. The two types of custody that exist are called physical custody and legal custody. Physical custody is the part of a custody order that states where a child will live or spend his or her time. Legal custody is the part of a custody order that states who will be responsible for making decisions for a child’s life, including decisions about things like the child’s religion, education, travel, mental and physical health care, and more. Both physical custody and legal custody can be awarded in one of two ways: jointly to both parents, or solely to one parent. Joint physical custody in a child custody order allows for the child to live with both parents for approximately equal amounts of time, although it is rare and unrealistic that even with joint physical custody a child will spend exactly half of his or her time with each parent. Joint legal custody allows both parents the legal right to make decisions about the child’s life together. This does not mean that they need to agree on every single decision, but it does mean that they will need to work together and communicate regarding their co parenting arrangement in order to make decisions in the child’s best interests. Sole physical custody in a child custody order allows for the child to live with one parent, and only one parent. This might be because the parents live too far apart from one another to make joint custody an option, because one parent is in the military or away for a job, or it might be because it is not in the child’s best interest to spend time with one of his or her parents. If sole physical custody is awarded, the other parent may also be awarded visitation with the child. Sole legal custody allows only one parent the legal right to make decisions for the child’s life, and the other parent needs to go along with these decisions. In any custody order, both physical and legal custody are determined independently, and either can be issued jointly or solely, regardless of the other. When Can a Child Custody Order be Modified in California? I would like to know when I Can modify our Child Custody Orders in Anaheim, California? When a child custody order is modified in California, it could mean that what was once awarded as sole custody to one parent might now be awarded jointly to both, and vice versa. It could also mean that the specific days and times that one parent spends with the child might change, while the general terms of sole and physical custody remain the same. The extent to which a custody order is modified in court depends on the unique situation of the family involved and the best interests of the child in question. 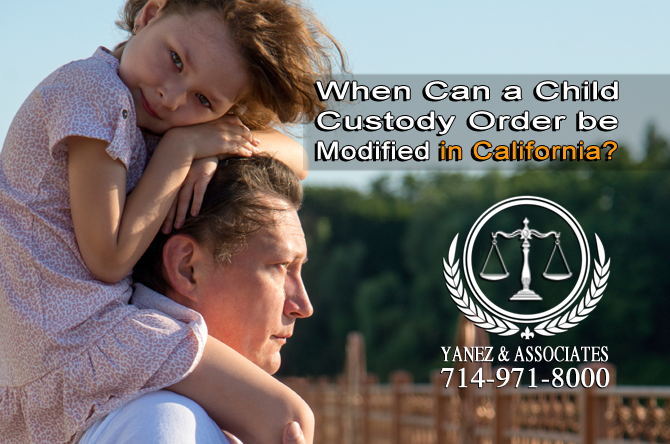 When asking for the modification of a child custody order in California, the parent or parents who request the change will need to show that there has been a significant change in circumstances, and that it has occurred since the last custody order was issued. This change in circumstances must be significant enough that the existing child custody order is no longer in the child’s best interest. The parent or parents may also present a new potential child custody order that would currently be in the child’s best interest, if approved by the court. It is always in a child’s best interest to have a stable and constant living environment; so modifying a child custody order too often is not in the child’s best interest. Some common changes in circumstances that may require the modification of a child custody order include the following. • If the work schedule or work location of either parent has changed, the child may be able to spend more or less time with one parent than the current custody order allows. • If one parent is moving, the child custody order may need to be modified. For example, if the noncustodial parent in a sole custody situation moves closer to the custodial parent, he or she may be able to share joint custody if it is in the child’s best interest. If either parent is relocating from their current home for a new job, new spouse, or new home, it may also require a custody order to be modified. • If either parent is not looking out for the child’s best interests, for example, if a parent is exposing the child to drugs or alcohol, abuse, or simply not getting the child to school, spending time with that parent may not be in the child’s best interests. There are many other reasons why a child custody order might need to be modified. If you have questions about modifying a child custody order, always as a legal professional, because he or she can help you understand how the law applies to your family. How Is a Child Custody Order Modified in California? I would like to know, How Is a Child Custody Order Modified in California, especially in Orange County? If you are ready to modify a child custody order in California, make sure that you consult with an attorney even if you plan to do most of the legwork yourself. An attorney can help you make sure that you fill out the correct forms, and that the information you put down is what is best for you and your child. You will need to start with a form called a Request for Order and one called a Child Custody and Visitation Application Attachment. These forms will give you the opportunity to explain why the existing custody order needs to be changed. If you, either on your own or with the other parent, have created a new potential custody order, you can also attach it to these forms. Always have a legal professional look over your forms before moving forward. Next, you will need to file your forms with the court clerk. Once you get your date for either court, mediation, or both, you will need to serve the papers on the other parent. This can be done through a process server, another person over 18 who is not involved in the case, or, in some cases, through certified mail. Once the appropriate papers have been served, you will need to file your proof of service, which tells the court that the other party is aware of the action filed in the court, and attend mediation and/or your court hearing. If you attend mediation, you and the other parent may be able to come to an agreement on your own as to what the new child custody order should be. However, if you do not come to an agreement, or if mediation is not ordered in your case, (you may also choose mediation before a court hearing) then the judge will make a decision for you. Following the hearing, if the judge has made a decision, he or she will sign a court order. Depending on the court in which you file, you or the other party may be responsible for preparing this order for the judge to sign. If you aren’t sure, ask your attorney if you have further steps to take in order to obtain your modified court order. Looking to hire one of Orange County's best Child Custody Modification Lawyers? If you have questions about modifying a child custody order in California, or if you are ready to file a motion to have your court order modified, always speak with a child custody modification attorney in your area. An attorney will be able to provide you with the most accurate and up to date information regarding the law and how it applies to your case. Contact the lawyers at Yanez & Associates to schedule your free initial consultation with a child custody modification attorney in Orange County. 2 What is Included in a Child Custody Order? 3 When Can a Child Custody Order be Modified in California? 4 How Is a Child Custody Order Modified in California? California Guide for Child Custody Laws, child custody, How Do I Modify Child Custody in California?, How Is a Child Custody Order Modified in California?, How Will the Court Decide My Child Custody Case in Orange County, Modification of Child Custody, Modifying Child Custody Orders in Orange County California, My Orange County Child Custody Case, Orange County Child Custody Modification Lawyers, What is Included in a Child Custody Order?, When Can a Child Custody Order be Modified in California?